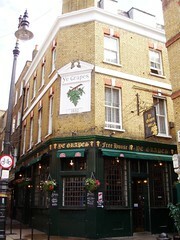 A pub in Shepherd Market in Mayfair, with six handpumps. It's quite small, and much of the seating is on raised daises. The decor is traditional, with lots of dark wood, and there are stuffed fish and game birds in glass cases above the bar. Kake and bob visited on a Tuesday evening in December 2008. All six handpumps were on, offering Greene King IPA, Sharps Doom Bar, Cottage Brewery Champflower Ale (£3.50/pint), Batemans Winter Cheer (£3.40/pint), and Stocking Filler (£3.50/pint). The beer was fine, though these are pretty high prices even for Mayfair. The place was pretty full when Kake arrived a little before 4pm - I started out my visit perched on a stool at the edge of someone else's table - and it remained fairly full until we left a few hours later, with no table remaining free for longer than about 5 minutes. This was probably exacerbated by some tables in the back having been reserved. The earlier customers may have been Christmas shoppers, as there were several parcels on tables and a noticeable clear-out around 4pm. According to a menu (December 2008), food is served noon-3:30pm and 5pm-9:30pm Monday to Friday, noon-9:30pm Saturdays, and noon-5pm Sundays. They have a reasonably-sized Thai menu, including a number of vegetarian options. There's a separate restaurant upstairs, and they also offer a takeaway service. A small selection of traditional pub food is available as well, though none of it is vegetarian. Accessibility: The toilets are down a flight of stairs with a slightly inadequate handrail. As mentioned above, much of the seating is up on daises. It's also quite small inside and gets pretty crowded. Last visited by Kake and bob, 23 December 2008. Last edited 2013-05-10 08:19:18 (version 5; diff). List all versions. Page last edited 2013-05-10 08:19:18 (version 5).